Imperial Whitetail Clover Seed - 1 Lb. Apple Obsession Deer Attractant - 6 lbs. Imperial Whitetail Tall Tine Tubers Turnip Seed - 3 Lbs. 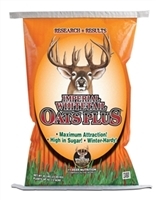 Imperial Whitetail Oats Plus - 20 Lbs.